In the past, people often didn’t keep their natural teeth long enough to have worry about damage caused by bruxism, also known as teeth grinding. Now that we have advanced methods and techniques that can help you maintain a full, healthy smile for many years, this significant issue needs attention so that you can preserve your quality of life. At San Diego Denture & Implant Specialists, Dr. Peter Johnson can provide expert assistance in relieving your symptoms and providing any custom-made restorations to replenish lost oral structure. Those who suffer from bruxism fall victim to an exaggerated grinding of the teeth that occurs outside the limited movement of a normal, functioning jaw. This habit often affects patients while they sleep, which makes it difficult for them to avoid. Many studies have shown that cases of bruxism tend to be caused by significant levels of stress, and common symptoms include headaches, increased tooth sensitivity, jaw or facial pain, and teeth that appear fractured, flattened, or worn with no knowable explanation as to why. There is no cure for bruxism as of now, but Dr. Johnson can provide much-needed relief for patients with the help of a custom-made oral appliance. 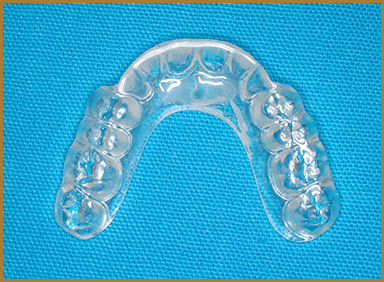 These devices are typically called a nightguard or splint, and their purpose is to protect your smile. They control the interactions of your teeth much more carefully, giving them an alternative area to damage that we can adjust or replace over time. They can also provide better support for your TMJ and prevent muscle fatigue. Instead of worrying about possible damage and oral pain, patients can now rest easy throughout the night. San Diego Denture & Implant Specialists is located conveniently by the Sharp-Grossmont Medical Center, and our team has been happy to serve the Greater San Diego community for over twenty years now. We’re located in the Grossmont Medical Center on the ground level floor of building #1. There is easy freeway access, as well as free parking adjacent to the office.